Mr. Tise is Wilbur & Orville Wright Distinguished Professor of History at East Carolina University. Remember all those big fat turkeys we sketched as kids when Thanksgiving rolled around every November? Even if most of us lacked any artistic skill whatsoever, we could make a stick figure of a plump and feathery bird complete with a bright red wattle waiting to become a Thanksgiving dinner. And we could also pencil or crayon black-hatted Pilgrims and Indians in feathery headdresses gathering at table to devour cranberries and a hugely breasted, cooked bird with drumsticks pointing skyward. Drawing this primordial American scene was one of the few rituals of our national civic religion -- just as American as apple pie -- in which we could all participate without fear of offending one religious group or another. Never mind that this homage to a pastoral original Thanksgiving was largely the creation of stiff Victorians who saw American history through the windows of Currier and Ives. Never mind that this fictionalized version of a love-feast between land-grabbing Europeans and innocent Native Americans was about as accurate as caricatures of a happy-go-lucky banjo playing slave. Never mind that English colonists in scattered encampments from New England to Virginia were always close to starvation; or that they literally stole their food from Indian tribes who, from time immemorial, only grew enough food or snared the game needed to support a subsistence living. But at the center of our sketches of the first Thanksgiving was that big bird. When all was said and done about make-believe Thanksgivings, imaginary love feasts, and feigned celebrations between European and American stick figures, there was the perpetual centerpiece of the Thanksgiving feast. Even if harmony among men was more hoped-for than real at Thanksgiving and though we might say different prayers to different gods, when our families gathered on this most American of days, we would always have that fat, winged delectable dish awaiting us -- the turkey. The turkey, after all, was so authentically American that our founding father, Benjamin Franklin (largely in jest) once suggested that the turkey was a more apt national bird than the eagle. But if the turkey is as American as motherhood and apple pie, why for god’s sake is the name of this bird the same as the name of a vast and important country in the Middle East? Not just any country, mind you. Turkey -- the proud nation we know today -- was the seat of the Ottoman Empire, the largest and most powerful political realm the western world has known since the decline and fall of Rome. Ottoman (mainly Turkish) military might from the thirteenth to the twentieth century covered as much territory and peoples as ever were controlled by Rome, across wide expanses of Asia Minor, Europe, Russia, and northern Africa. And, importantly, the Ottoman Empire was an expression of Islamic religion, learning, and culture in a golden age of wealth, knowledge, and power among the followers of Mohammed. How the American bird we know as turkey got the moniker “turkey” and not huexoloti (Aztec) or guajolote (Mexican) -- authentic early American names for American turkeys -- has much to do with the fact that Turkey was the center of the world at the time Christian Europeans began taking a few baby steps toward finding an alternative route to India. For when our hero Christopher Columbus sailed the ocean blue and planted the flag of Christian Spain on Native American lands, he was not merely hoping to chart a shorter, cheaper route to Asia. He was also looking for a trade route for Christian Europe that did not involve using a fifteenth-century pipeline that crossed problematic, if not hostile Islamic lands. Since the Christian monarchs of Spain attempted to delete both Islamic and Judaic residents from all of Iberia the very day Columbus sailed into the Atlantic, it was vitally important for the Italian explorer to find a different way of transporting those high end Asian commodities -- spices, textiles, ornaments -- to which Europeans had become addicted. When Columbus eventually realized that he had not discovered an alternative path -- that he had instead encountered a pole to pole intruding obstacle between European hither and Asian yon, he began to do what most goofing explorers have done throughout human history. He took home a batch of alternative goods that he hoped would capture the interest of his investors. In the absence of gold -- the holy grail of American treasures -- he focused upon American animals and plants that had been domesticated by Native Americans. Among these were plant products that could be grown from seed or stem: beans, maize (corn), peanuts, peppers, potatoes, and tobacco. In the realm of fowl, there were two interesting creatures: (1) the Muscovy duck (Cairina moschata) and, of course, (2) our good old Aztec huexoloti (Meleagris gallopavo). We will not worry about how tame American ducks got a Russian name, but rather concentrate on how huexoloti became turkeys. When the huexoloti -- tamed by Aztecs as an important food source -- got to Spain, the fireworks began. Since Spain was at war with most of the nations of Europe, all goods imported from America were treated as state secrets to be hidden from hated enemies -- especially the English. But while Iberian ports might be closed to rival nations, there was an irrepressible seafaring trade in the Mediterranean that could not be halted. Although King Ferdinand and Queen Isabella might have driven Islamic Moors and Spanish Jews to exile in North Africa, they could not stifle an irrepressible traffic in merchantable goods that had bee-hived the Mediterranean for thousands of years. Probably before a single ship from America had been unloaded, contraband in seeds, birds, and beasts were headed from Spanish ports to points of call across northern Africa and the Middle East. When corn, tobacco sprouts, and, of course, our huexoloti arrived in the heart of the thriving and vibrant Ottoman Empire -- seated in what we now know as Turkey -- they came into the hands of probably the most advanced farmers and husbandmen in the world at that time. Turkish farmers had previously seen the nearest cousins of the huexoloti from Asia (pheasants) and from Africa (Guinea fowl). But these birds were skinny runts compared to the majestic huexoloti. Making use of sophisticated growing and seeding techniques, savvy Turkish farmers in the space of just twenty years had a surplus of both birds and plants for export across Europe. By the 1540s Turkish corn, tobacco, and, yes, our huexoloti arrived in England. They were embraced, at first, as novelty items to be enjoyed in posh castles of the English upper crust. By 1577 what was once nouveau, the huexoloti had become the principal food bird in the entire English realm -- surpassing even chickens and other fowl in both production and consumption. It will thus probably not come as a surprise that these crops and creatures originally brought forth from the New World had acquired interesting new and permanent names. Corn arrived in England as Turkish maize. Tobacco took an identity it still has today -- Turkish tobacco. And the good old huexoloti had lost all association with the new world and would be forever known in English simply as the turkey. This explains how the American huexoloti acquired its name from Turkey, but not how the turkey from Turkey became the Thanksgiving bird of the United States. That brings us back to the Pilgrims and their plump turkeys. If the Pilgrims and other English colonists served wild American turkeys -- or so the story goes -- at their Thanksgiving spreads, how could they have had such robust breasts? 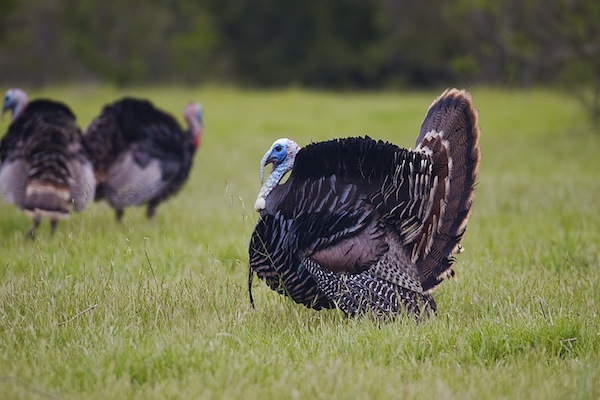 Wild American turkeys (silvestris, or cousins of the huexoloti) were sleek and ravenous scavenging birds that raced from one meal to another eating nuts, seeds, berries, grapes, snails, crickets, beetles, and delicate shoots arising from many cultivated crops. Resistant to control or reproduction in captivity, they were notorious enemies of proud farmers. Fleet afoot, able to fly short distances, and properly cooked a tasty dish, they lack the proper manners to live in an agricultural society. They were, in fact, killed everywhere by European colonists as nuisance birds. English settlers in both Virginia and Massachusetts, spoiled with the familiar, though less tasty big birds that came from Turkey, immediately demanded to bring their own turkeys to America. English turkeys deriving from Turkey arrived in Jamestown in 1614 and in Massachusetts prior to 1629. As European settlements spread, so did their herds of domestic turkeys. The wild cousins of the huexoloti that once inhabited most of North America retreated to more congenial frontiers -- as did their native names. Domesticated turkeys from Turkey displayed another very interesting habit. When tobacco emerged as the first cash crop of the southern colonies, it was found that these mild-mannered turkeys from Turkey were no threat whatsoever to tobacco plants. The busy foragers for barnyard grains and kitchen food scraps considered the hornworms that infested and destroyed tobacco plants a very tasty delight. They could be turned loose in tobacco fields. One turkey could clean hornworms from a thousand tobacco plants; fifty could handle a hundred thousand plants. One can only wonder whether Turkish farmers as they groomed these birds to grow large breasts also managed somehow to extinguish their taste for Turkish tobacco! This latter finding brings us full circle to the question of how Americans could have overlooked so thoroughly this unique heritage we derived many centuries ago from the Middle East. We tend to think that America discovered the Middle East when our oil companies went to Islamic lands in search of liquid gold; when we remember American links to the state of Israel; and when we contemplate that Jews and Christians trace their religious roots to Jerusalem. We too often forget that Islamic believers find their religious origins in the same land; that Jews, Christians, and Muslims worship a single God; that a thousand years ago Europeans crusaded to dislodge the Islamic branch of this tradition from this shared homeland. And, also, that while Europeans were building a Holy Roman (i.e., Christian) Empire bereft of Moors and Jews, busy Islamic merchants, lawyers, alchemists, and farmers inhabiting the Middle East were advancing the world’s knowledge in mathematics, chemistry, law, and, yes, agriculture. Thus, this Thanksgiving when we gather to partake in this most hallowed and quintessential of America’s holidays, we should remember as we look toward the big bird in the middle of our table that it is after all a turkey that came to us from Turkey; that it was brought into our culture by European forbears deeply influenced by their connections to Islamic commerce and culture in the Middle East; and that we have been a part of a shared planet for a very long time. And, then, let us say our thanksgiving prayers to Yahweh, Allah, or by whatever name might be known the God of these shared faiths. Good article! I am glad to say the wild turkey has been re-established in the 48 contiguous american states and even in Hawaii. The osceola subspecies here in Florida is thriving and provides a challenging hunt. I have savored its flavor unlike its more bland domestic cousin. When I was a Turkish kid at an American school 6th grade the kids used to call me turkey turkey gobble gobble. It wasn't the least funny. Funny thing is: in Turkey the bird Turkey is called "Hindi", since the Turks thought the bird came from further east, in this case from India (Hindistan). As a tradition, Turkey bird is eaten as a whole, only on New Year's Eve in Turkey, therefore, it's not even possible to find the whole bird other times of the year, otherwise turkey meat in many forms (even turkey doener)is sold all year long. I'm a Turkish-American & happen to be in Istanbul at this moment, and I've been trying to find a turkey for our Thanksgiving dinner, but was told at various markets, the birds will ship out only after the 15th of December. I put in a special order, and not yet sure if it'll come by Wednesday. Otherwise, we'll have to eat a chicken! !